Eugene (Sept 21)--The Lane County Court website notes two events for Miss Debbie on the docket today when she appears in criminal court at 2:30pm PST today. Frisch's Pre-Trial Conference (on 3 charges of Menacing, and charges of Criminal Trespass and Making a False 911 Call: Case 15CR35139). This conference gives Debbie a chance to plead GUILTY to her criminal behavior. Otherwise, she faces heftier consequences if she demands a trial to prove her obvious culpability. 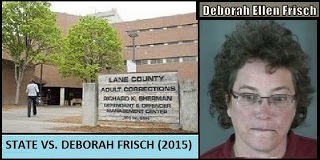 The State has already reserved Tuesday, October 6th for Frisch's trial, should she fail to take responsibility for her behavior through a guilty plea. There is also an "Motion" to be considered next Tuesday, Sept. 29. The substance of this Motion is, as yet, unknown. Meanwhile, today marks Debbie's 38th day behind bars; she was caged on August 15th, after her most recent arrest.